The FOAOTMAD news blog announces that application forms will be available early this week for its next old-time fiddle and banjo workshop weekend, which will be on 24-6 Nov. 2017 in the pastoral setting of the Wye Valley Youth Hostel at Goodrich, near Ross-on-Wye, Herefordshire, England. The teachers will be Jane Rothfield (USA) and Gabrielle Macrae (USA). 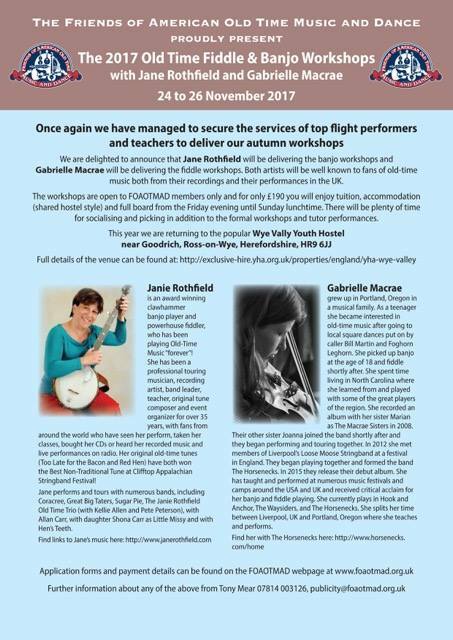 Anyone who has seen and heard the Horsenecks on their recent tour in Ireland knows Gabrielle's powerhouse fiddling and apparently inexhaustible repertoire, and she is also known for her clawhammer banjo work. The bad news is that only FOAOTMAD members can attend, but we assume that anyone keen enough to go will already be in FOAOTMAD. Full details on the poster image, which is also on the FOAOTMAD blog.